At Spanish Playground, we are big fans of Rockalingua. We are happy that their great songs are now available on a new DVD of Spanish music videos. This DVD has 13 excellent music videos with songs that kids will love. 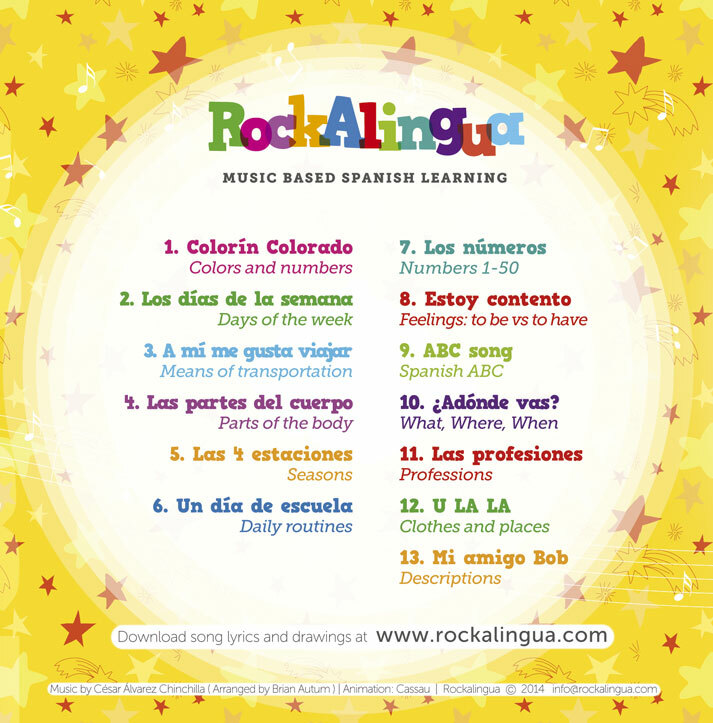 You can learn more about the music videos and other Spanish learning materials on the Rockalingua website. Enter below to win this great DVD! The giveaway will run through Sept. 9th. The images correspond to the lyrics to create comprehensible input. A contemporary sound appeals to kids. The songs teach vocabulary and structures commonly included in elementary curricula. These Spanish music videos a perfect supplement to any program. For example, there are songs that teach numbers, letters, days of the week, seasons, parts of the body, common first person verbs, adjectives, feelings, means of transportation, clothes, places, professions, and more. On-screen lyrics make it easy for kids to sing along. The videos are entertaining. These Spanish music videos are not the same, but they are all high-interest. They are funny (Mi amigo Bob) or cool (ABC song) or cute (Colorín Colorado). An up-beat tempo makes the songs fun to sing. Printable sing-along lyric sheets with drawings are available on the website. Worksheets with the vocabulary and images from the Spanish music videos are available on the website. The materials require no preparation on a teacher’s part, yet provide an effective, fun learning experience. I can walk into class with these Spanish music videos and lyrics sheets and teach a lesson. One of the things I love best about these music videos is that they are a fabulous way to spiral material. All of us work hard to re-enter what we teach, but as kids acquire more language, it gets harder and harder to do. Singing is an effective, quick review of vocabulary and structures. When it is coupled with video, kids get a tremendous amount of language in a few minutes. With a whole class actively involved singing, this is a very efficient use of class time! Enter the giveaway below to win a copy of this great DVD! My daughter is 4 years old. In my family there is a little girl (6 months old) who discovers spanisch and german at the same time! Listening to spanisch songs is just perfect for her in the next years!! My boys are in 1st, 3rd, and 5th grade this year and we LOVE to learn Spanish with MUSIC and DANCE!! My students are in PreK and love to sing and dance to Rockalingual’s rockin’ music!!! I have one student (as of today, our official first day of preschool) in preschool. She’s 3 years old. I teach grades 2-8 and would love the music videos! Love your stuff! My kids are in 6th and 3rd and I tutor middle and high school Spanish students. I am thinking about homeschooling for preschool and I this would be perfect!!! My 3 year-old would love it. I have kids in kindergarten, second and fourth grades (and one still at home with me! ), and my Spanish students are in grades PreK through 2nd grade! My students are K – 5th. I’d love to add your music to my curriculum! I teach pk-6th grade Spanish at two elementary schools in Mississippi. My kids love these songs! I teach 1st Grade Spanish Immersion! What a fun giveaway. Thank you Jenny! What a fun giveaway for any family with children or elementary school teacher. My kids are all in the elementar years and I also teach Spanish to Elementary kids Thank you Jenny! My son is in 1st grade and two preschool girls – all 3 are bilingual. Would love this! I teach Spanish to k-6. My grandchildren all love your music, ages 6 7, and especially the almost 2 year old!. Would love to donate your music to their school! There is not better way to learn than with music!! We love Rockalingua at our house! My kids are 3rd and K.
My students are in the 4th and 5th grade and would love this! I teach to a 1st grade girl named Camena and she loves to sing and dance. She’ll enjoy this DVD. My daughter is 4 and I teach a small group of kids ranging from age 6 to age 10. I teach grades 4, 5 & 6. Each class gets 2 hours/week of Spanish. I teach Spanish at the high school level and I’ve found that my “big kids” love learning with music like this just as much as any of my elementary-age students ever did! Enseño español en una escuela de primaria y tengo dos niños bilingües en casa (4 y 7). Me encantaría tener los vídeos para mis clases. Muchas gracias por esta oportunidad. My students are 3 and 4 year olds! We love to sing, dance, and play. Love this site – my students are 1 – 4 graders. We do a lot of activities and singing! I’m a new Spanish Teacher for ages 3 through 12 year olds. I would love to have this program. Thanks! I privately teach Spanish to preschool/young elementary students – they LOVE songs, and learn a lot from them! I’m always looking for new ones! I want this DVD so bad! my kids love these songs, but you can only access so many on YouTube, and I would love for them to be able to pop this DVD in and learn some really fun, really creative songs! I teach 2 year olds through 9th graders and love Spanish Playground! Thank you for being such a wonderful resource! I work with classes of all ages from 5 to 11. We love learning Spanish. We just started Spanish in our elementary school that is Preschool-4th grade! Our kiddos are loving Spanish and would love some Spanish songs! Hi! I’m from Costa Rica and I’m teaching children between 5 and 10 years old. It’s great! My kids are 11 (6th grade), 9 (4th grade), 7 (second grade), and 2. I home school my kids. This would be a great addition to our Spanish Learning.